TimeZone : Public Forum » New Arrival! Been a LONG time coming. (Excuse the bad cell phone picture, just wanted to post this). About 10 years ago, I was looking at the 'Moonwatch' as a possible option. I actually came close to buying it then, but never got around to it. On and off, for the past 10 years, I thought about it, but never really tried it on when I visited dealers, and just never got serious about moving forward. Finally, a co-worker bought one, and that pushed me over the edge. I liked the design, I liked how classic it was (there is nothing left to chance with this watch, every question has been asked and answered, what you see is what you get), and compared to almost everything else I wanted, it was reasonably priced for what I find to be an interesting piece. Many of you helped with a poll I had a few weeks ago, and that settled it. So far, only a few days on the wrist. The dial of this watch just pops. The contrast between white and black is intense (but not overbearing like some pilot watches, with the super-thick white printing). It is legible, yet delicate in its design...easy on the eyes if you will! Lume or not, very easy to read in low light. 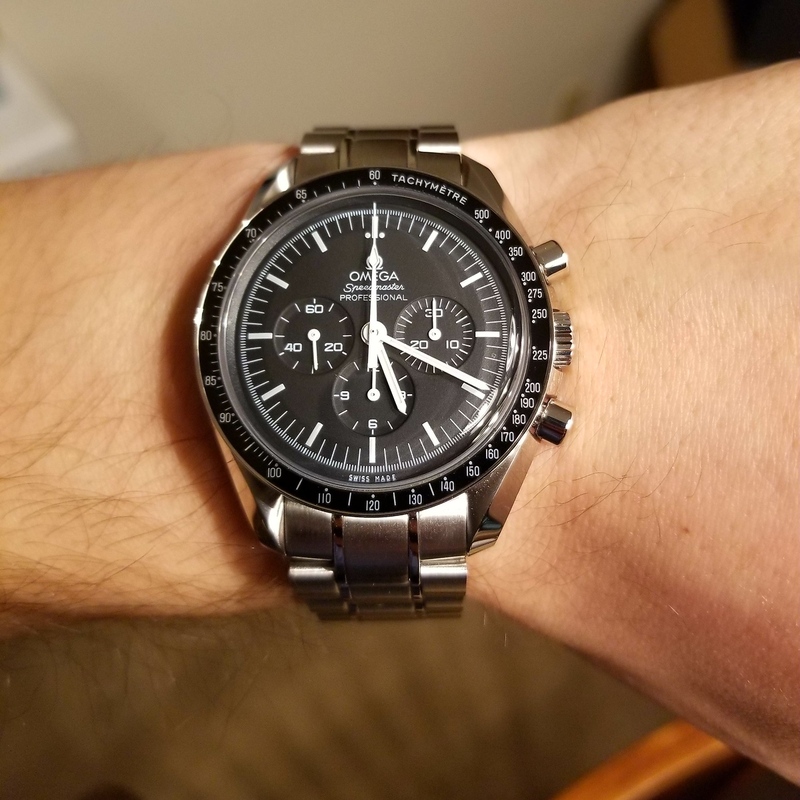 I have been staring at this watch for a decade, but now it is on my wrist, it is better than pictures and better than I imagined it would be. Most watches are the opposite, better in the fancy press and catalog photos than in person. This is my first (real) watch without a date, or a rotor, so will be good to see if I like this or not. So far, no regrets. My only complaint would be the desire to have more adjustment options for the bracelet. Would like to have a third set of holes for the micro adjust, or a bracelet with more options. I will likely try it on some of the period-correct straps. Finally, there is just an aura this watch emits. Even dismissing the history of the watch, there is just 'something' about it I cannot explain. I got the same sort of feeling from some Breguet, Lange models (at 4-10x the price), there is just 'something' that makes them special. Topper Fine Jewelers in California (a TZ sponsor) was great to work with - would be eager and willing to buy from them again. Rob helped me. Next Topic: On The Units of Time - Where?